Eve Aschheim, a Lecturer in Visual Arts at the Lewis Center for the Arts at Princeton, is an abstract painter whose recent works reflect a dialogue between intellect and instinct. 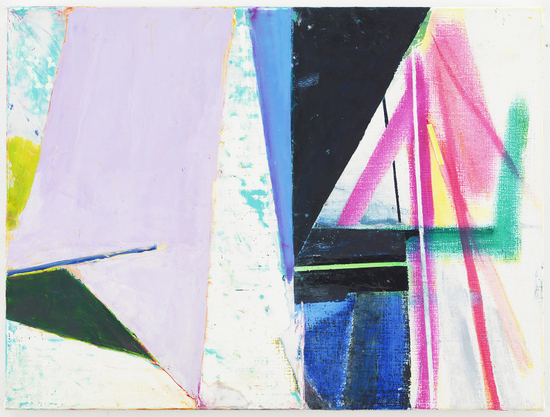 A formalist who is attracted to geometry -- and who is sensitive to minute changes in position and line -- Aschheim is currently exhibiting her work in a two person show at the New York Studio School alongside paintings by Ying Lee. I recently interviewed Eve, and asked about her background, her work and her ideas. Eve Aschheim Eve, can you tell me a bit about your background? I was born in New York City, but much of my childhood was spent in Menlo Park, California. We also lived in Singapore for two years in the early seventies. 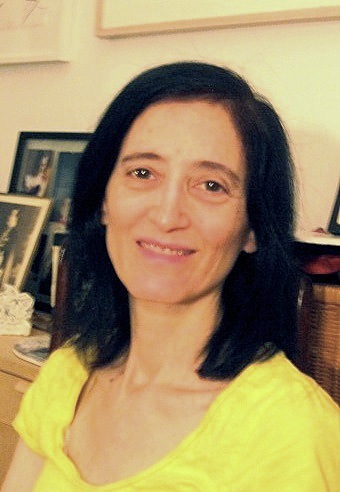 My parents, European Jews, were nomadic and adventurous. By the time I was 15, I had seen art in a lot of different contexts: Japanese rock gardens, Malaysian puppet theater and batik workshops, the Hindu street procession of Thaipusam, in which devotees walk in a trance, with spears piercing their cheeks, lemons dangling on fishhooks in their backs, bloodlessly. I also saw Pompeii and the Sistine chapel. It took me a while to realize that every kind of artistic preoccupation had its own conditions and conventions. Though my parents, scientists, rarely went to museums, they both loved to look at the world around them, at things that made sense, and things that made no sense. They loved flea markets and the stores on Canal Street, New York. Every thing out of place was a clue to decipher. For example, when we were in Haiti, my mom noticed that many of the houses and restaurants on the coastline weren't facing the ocean. 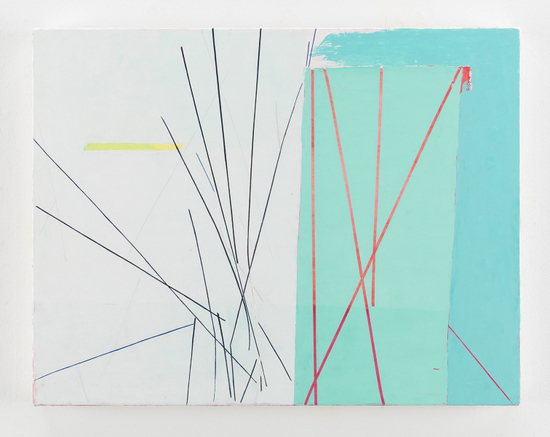 Eve Aschheim, "Blue Before Orange," 2012, oil on canvas on panel 17 x 22 in. Artwork photography: Christopher Burke Studios Since you attended college in Northern California ( U.C.s Berkeley and Davis ) what did you absorb from California art and artists? I basically studied with everyone there. My first major influence was Elmer Bischoff, who stressed reacting to what you see and finding something mysterious that came from an unconscious place. A lot of his figure drawing class was based on invention and not just observation. When I started thinking about my own artistic preoccupations, I realized I wasn't interested in biography, narrative or depicting objects. It seemed that if you took those out of painting, what's left are issues of pictorial space, time, motion and other ideas. I remember going to a lecture by Robert Irwin at the San Francisco Museum of Art, and being taken by his descriptions of adjusting lines and just staring at them for hours. If this is what an artist did, I wanted to sign up. I started doing projects with particular line configurations, just to see what choices I would make. That led to my current work. 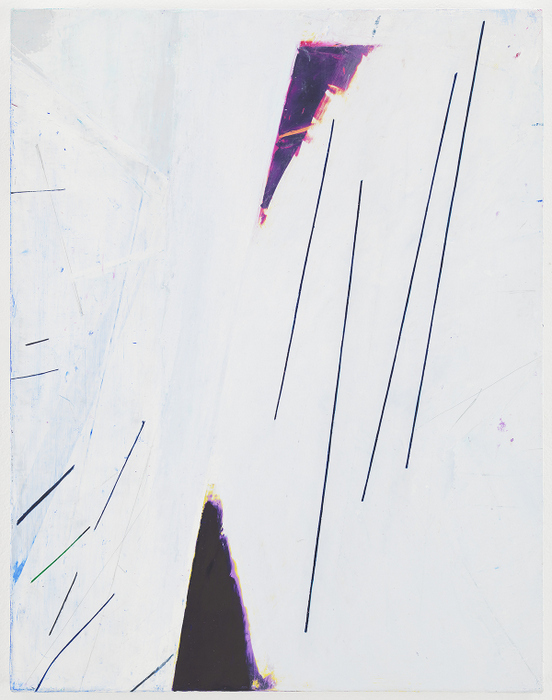 Eve Aschheim, "Bullet," 2013, oil and graphite on canvas on panel 14 1/16 x 181/4 in. I understand you are writing something about Wayne Thiebaud, who was one of your mentors. Chris Daubert and I interviewed Thiebaud - it will be published this year. Since we were his Teaching Assistants in the 80s, we had a lot of unanswered questions about his thinking, and his approach to teaching. He was a major influence, in many ways. He understood the relationship between drawing and painting, and how fluid and dynamic that boundary can be. Your work has been characterized as dealing with "implied motion" and "states in the midst of change." Can you tell me more about how those ideas are present in your work? Much art is concerned with static and defined forms. I am interested in a more active situation, in which the structures are actually in states of transition. So you see it one way and then another way without being able to settle on a final image. I think this comes from many things. In Either/Or, Kierkegaard says that as we make choices for one direction, we eliminate the others. In painting, I thought we could have both. In The Interpretation of Dreams, Freud writes that there is no "either" and no "or", only "and", in dreams because images can't be withdrawn. I wondered if I could have "either", "or" and also "and" in my work. In some of my works you can see a structure one way and then another way, but not at the same time. In some works this happens at the same time. I am also interested in that moment before thought has fully coalesced, when the choices are like a glimmer of some possibility. 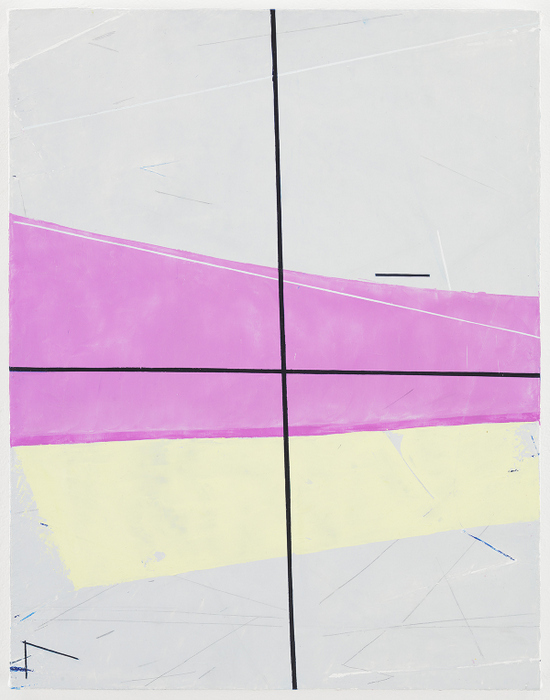 Eve Aschheim, "Decider," 2013, oil and graphite on canvas on panel 18 ¼ x 14 1/16 in. Is it accurate to say that your work is situated between abstraction and representation? Yes, for many years I worked in two different modes: my paintings were about empirical problems in abstraction, for example, I worked with small lines to see what I could do with them. I realized the power of a tiny line: when I moved one line the entire composition would change. Meanwhile, my drawings incorporated things from the real world, things I observed or thought about, such as a subway turnstile -- the tall kind with bars -- which is a corner space that rotates, keeping you out or letting you in. I would translate these configurations into abstract pictorial images. A problem with abstraction is that one has to generalize to make something abstract, but it may lead to a generic abstraction, which one has to make specific. What that means is not so transparent or obviously clear, it's not always apparent how to proceed, but often you know when you have done it. 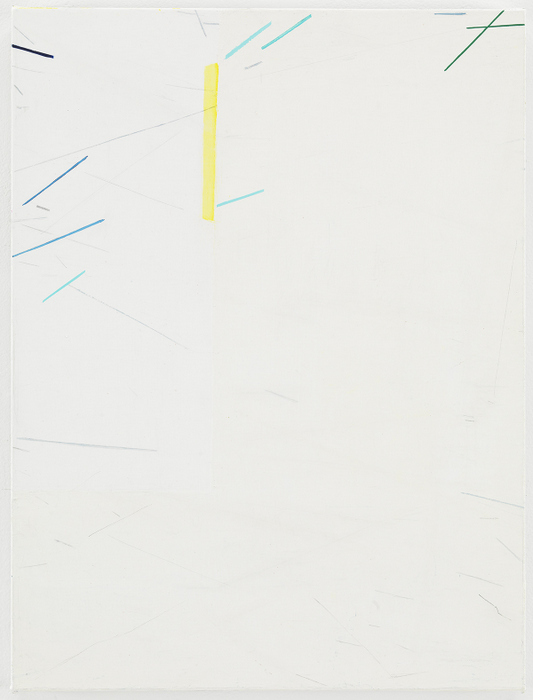 Eve Aschheim, "Line Light Light," 2013, oil and graphite on canvas on panel 16 3/16 x 12 1/16 in. How would you describe your most recent work? In the past few years, I have begun to merge my painting and drawing practices, and the paintings are changing a lot. I also began use color more deliberately, for example using color as light. This year I was awarded a Guggenheim fellowship, which allowed me to paint nearly every day. I am working with various structures that break apart, coalesce and reform. My inclination is toward geometry and the calibration of individual elements. I let the structuring principle evolve out of the working process. Eve Aschheim, Steel and Soaking, 2013, oil on canvas on panel 18 1/18 x 14 ¼ in. How do you think of your painting titles? I try to come up with something that is parallel to the work and related, but not descriptive in a limiting way. My daughter has thought up some terrific titles, for example "Blue Before Orange", "Colossus", "Steel and Soaking", "xLR-8" and "Anomaly". You have shown several times in Europe. What was that like? I have worked with some really special gallerists: Magnus Aklundh, Inga Kondeyne, and Rainer Borgemeister. I started showing there in 1997, with Rainer Borgemeister in Berlin, and then in Cologne, Germany and Sweden. In 2001 Rainer Borgemeister held a two-person show with my drawings and those of Malevich. I've been looking at Malevich since I was in high school, when my sister took me to the Malevich retrospective at the Guggenheim Museum. I felt like I "got" his work even though I don't think we talked about it. Even in Leah Dickerman's recent show at MoMA on the origins of abstraction, Malevich stands out as a radical iconoclast, presenting the canvas in a very extreme way. What are your interests outside of art? Recently I've been reading books on how the brain works and James Joyce. 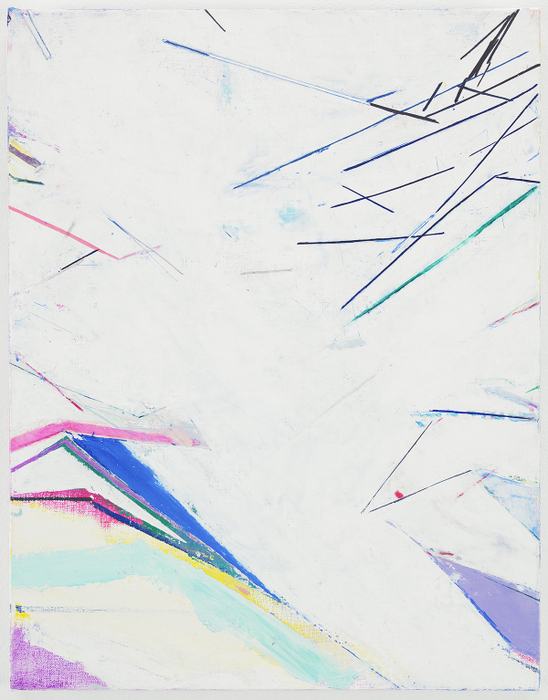 Eve Aschheim, "Which Reverse," 2013, oil on canvas on panel 12 1/8" x 16 ¼ in. What are your plans for your work? I don't know what I am going to do next. If you are trying to make something unpredictable, then you yourself don't know what that is. That means you have to go with your instincts, direct yourself, but try things and stay open. You have to accept not knowing, which is unsettling, but it allows new things to happen. I am continuing with the paintings, and also working on drawings for shows next year at Lori Bookstein Fine Art, New York City and Galerie Inga Kondeyne, Berlin.